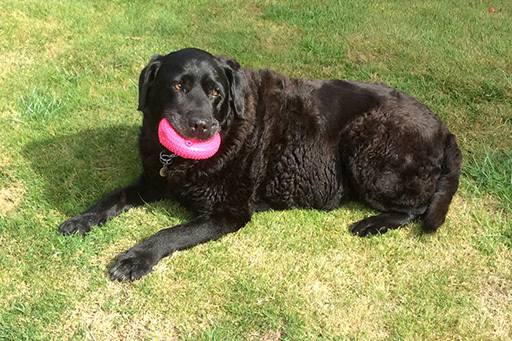 Truffle the Labrador's case shows why we shouldn't give our dogs bones! A Pet of the Month case for not giving your dog a bone! We all love to make our dogs happy and see them enjoying life. Truffle is a 12 year old Labrador who, like most Labradors thoroughly enjoys her food! Over the years her loving owners have liked treating her to the odd bone that she hugely enjoys. However, recently poor Truffle suffered a life threatening experience which demonstrates why we do advise that we don’t give our dogs bones – particularly cooked bones – despite the obvious pleasure it gives. On a Sunday evening in September, Truffle was given a cooked lamb bone as a treat. The next day she seemed a bit off colour but her owners weren’t unduly worried. However on the second day she was unusually lethargic, completely off her food and attempting unsuccessfully to vomit. That night she became very distressed and her owners rushed her to a local emergency vets in Devon who examined her and administered treatment for vomiting. Despite the treatment, her condition continued to deteriorate, with on-going vomiting, lethargy and loss of appetite. The next day she was taken to the local vets in Devon, who examined her and kept her at the surgery for the day for treatment and fluid therapy. She was sent home at the end of the day brighter but still not herself and she soon started to deteriorate again. At this stage her owners decided to travel the hour to get to Quantock Veterinary Hospital where she had been seen previously for a different condition. Vet Dominic examined her carefully noting the recent history of eating a bone and her rapidly deteriorating condition, Truffle was admitted to the Hospital for blood tests, x-rays and ultrasound scans of her abdomen. Within 2 hours an obstructing bone fragment had been identified in the intestines and Truffle was in the operating theatre undergoing life saving surgery. A large bone fragment had lodged at the junction of the small and large intestine, a common site for obstructions (indicated by red arrow on x-ray image). “The bone was too large to pass through the intestines and had become lodged at this natural constriction in the bowel” explained Dominic “in theatre we had to remove a 6 inch section of damaged intestine within which the bone fragment was stuck; the pressure from the bone had already lead to the perforation of the intestines at that site, making this a life threatening condition”. The intestine was successfully reconstructed after the damaged section had been removed. “Bones can cause serious injuries to the oesophagus, stomach and intestines in dogs. 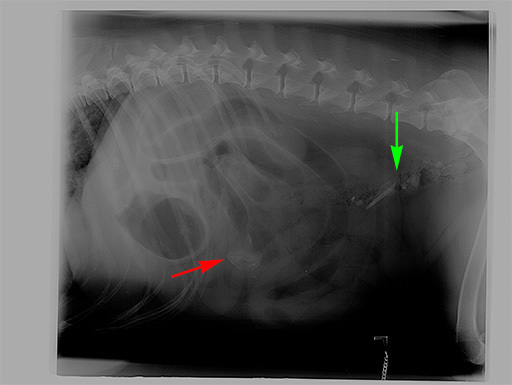 As well as the lump of bone, Truffle’s colon was full of sharp shards of bone that would have caused some damage to the lining of the intestines as they passed through (indicated by green arrow on x-ray image). In Truffle’s case if we hadn’t carried out the surgery when we did she would have died within 24 hours. When the intestines perforate from damage such as this, a life threatening infection of the abdomen, peritonitis, is caused”. Fortunately for Truffle the operation was successful and after having to go through major surgery, four days in intensive care at the Hospital being nursed by a 24 hour nursing team, having regular post-operative blood tests and follow-up abdominal ultrasound scans, she was able to go home to recuperate. After a couple of weeks taking it easy she was back to her very bubbly self and enjoying her food and her full life once again. Her hugely relieved owners said “After a number of unsatisfactory consultations and treatments at other veterinary institutions, we arrived at the Quantock Veterinary Hospital with a seriously ill dog. Within a few hours, all necessary tests had been completed and corrective surgery carried out. Truffle is now fully recovered and we’d like to commend the team at Quantock Vets for 3 critical aspects, firstly the high level of skill applied to a complex problem, secondly, the obvious level of care and affection shown by the staff to their animal patients and finally, the understanding and compassion by the staff to inform and reassure worried owners. We are deeply pleased with all aspects of their work and unreservedly recommend them to other pet owners”. Dominic continued “Luckily we don’t frequently see such serious bone related injuries such as Truffle’s. Normally dogs manage to digest bones, especially raw ones, without too much trouble, and there’s a lot of mixed opinion and contradictory advice about recommendations for giving bones to dogs for nutrients and dental health. However, we see enough problems with dogs suffering digestive tract damage and obstructions caused by splinters or larger pieces of bone becoming stuck that I would simply recommend not giving them any bones”.